First semester Principal Award winners from the Upper Elementary 2nd and 3rd Grades have been presented with their awards. Principal Award winners are chosen by their teachers because they exhibit great character, have a positive attitude, and always try their very best. These winners have impressed their teachers with these qualities! We are very proud of our students and the goals they set and achieved for themselves. 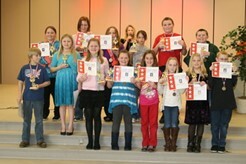 First semester Principal Award winners from the Upper Elementary 4th and 5th Grades have been presented with their awards. Principal Award winners are chosen by their teachers because they exhibit great character, have a positive attitude, and always try their very best. These winners have impressed their teachers with these qualities! We are very proud of our students and the goals they set and achieved for themselves. 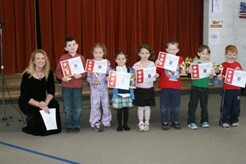 First semester Principal Award winners from the Jack D. Jones K and Young 5's have been presented with their awards. Principal Award winners are chosen by their teachers because they exhibit great character, have a positive attitude, and always try their very best. These winners have impressed their teachers with these qualities! We are very proud of our students and the goals they set and achieved for themselves. Pictured: Mrs. Watson, Alexander Ringler, Vanessa Kenny, Courtney Jackson, Sierra Thompson, William Fehrlen, Trevor Plotts, Keagan Kailing. 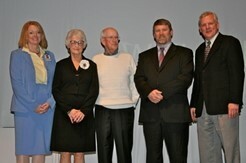 White Cloud Public Schools is honored to present the “I Care” award to Mr. and Mrs. Orrie & Pat Ebenstein, who have supported the White Cloud School District for over 50 years. Both Orrie and Pat are devoted members of the White Cloud community. Orrie has previously served on the White Cloud City Council and is presently serving on the Parks and Recreation Committee. He has been active in Scouting since 1942 and was a Scoutmaster for several years. Orrie was employed by the White Cloud Public Schools as both a bus driver and then a custodian until his retirement. Many children have been greeted with a smile and a positive word to start their day. Pat has volunteered with the United Way for decades, has been active with the American Red Cross for 55 years and been a member of the White Cloud Community Library governing board for 50 years. She has also been active in the Methodist Church. Both Pat and Orrie are a team when it comes to volunteering as hosts for the Quiz Bowl Tournaments held in White Cloud as well as selling tickets at athletic events and helping out in anyway that they can. In years past they have chaperoned numerous school events, dances, and competitions attended by students. You can almost always find them in attendance at school events to give their support and encouragement. They have also given monetary support to the Quiz Bowl, Band and Choir programs, and donated books to the elementary libraries. They regularly attend school board meetings to keep the board on track. Pat and Orrie possess strong values, are not afraid to stand up for what is right, and to voice their opinion even if it is not the most popular. They are exceptional role models not only for kids, but for adults too. They are a blessing to our schools and community. Pat & Orrie, thank you for making a difference! White Cloud High School has been named one of the nation's best high schools in a recent study by U.S. News & World Report . U.S. News & World Report - in collaboration with School Evaluation Services, a K-12 education and data research and analysis business that provides parents with education data - analyzed academic and enrollment data from more than 21,000 public high schools to find the very best across the country. 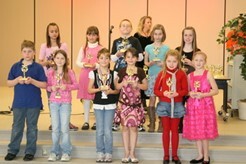 These top schools were placed into gold, silver, bronze, or honorable mention categories. White Cloud High School earned a Bronze Medal for successfully meeting two of the three key performance indicator criteria. U.S. News uses a three-step process that analyzes first how schools are educating all of their students, then their minority and disadvantaged students, and finally their college-bound students. One major challenge all of the nation's best public high schools are facing is how to continue to challenge students despite budget pressures, the report noted.